Breakfast at Nei Jiang Hotel was nothing spectacular. We found our breakfast, i.e. a sandwich and a packet of juice, conveniently packed and hanging on our door handle as we were leaving the room. 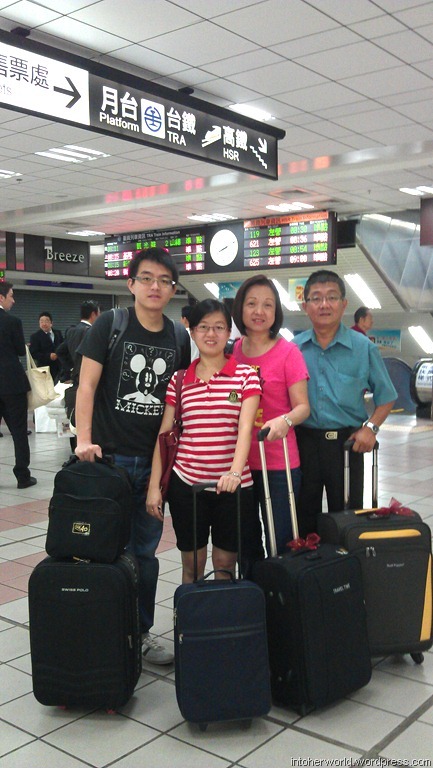 After checking out from Nei Jiang Hotel, we headed for Taipei Main Station. We had to take two separate cabs because taxi drivers in Taipei could only take a maximum of four passengers and there were five of us. We disembarked at the West 3 entrance and proceeded to the HSR ticket counters. 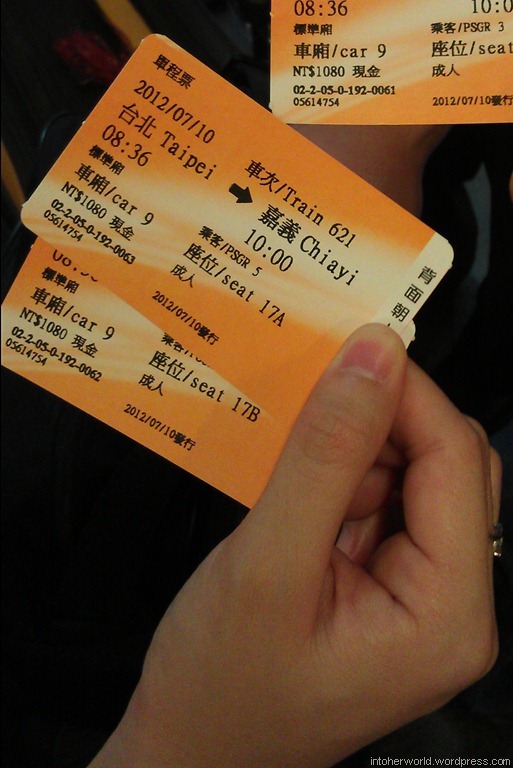 Five adult tickets from Taipei to Chiayi cost us NT$5400 (NT$1080 each). 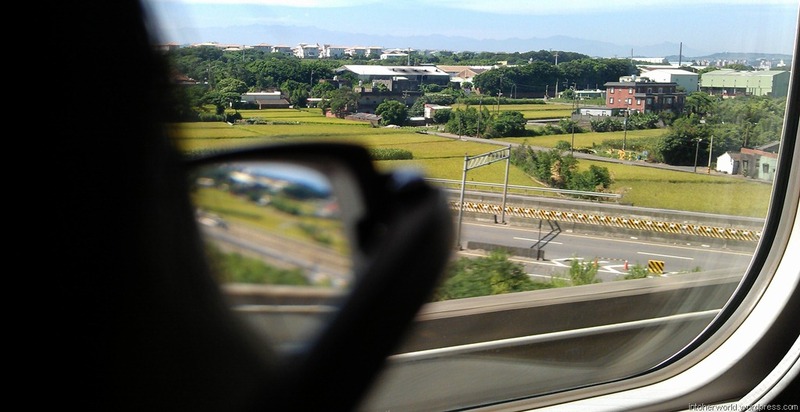 The bullet train that we were taking was scheduled to depart at 8.36am; and salute to the transportation system in Taiwan, the train left the station at 8.36am on the dot. We were impressed! 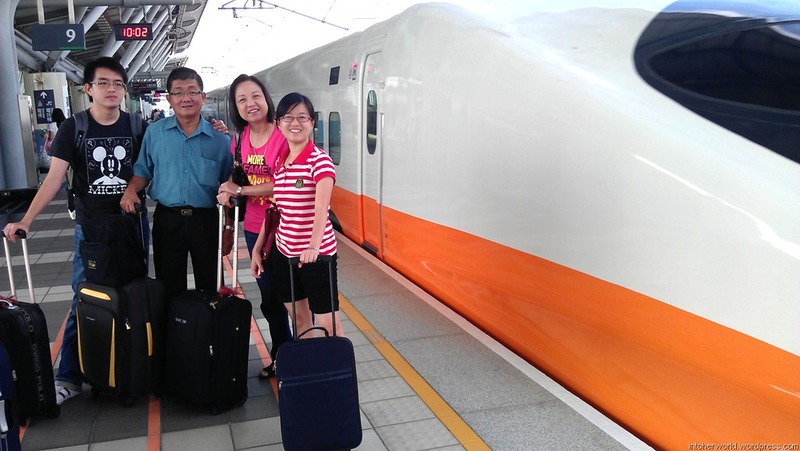 We arrived at Chiayi HSR station at 10.00am. 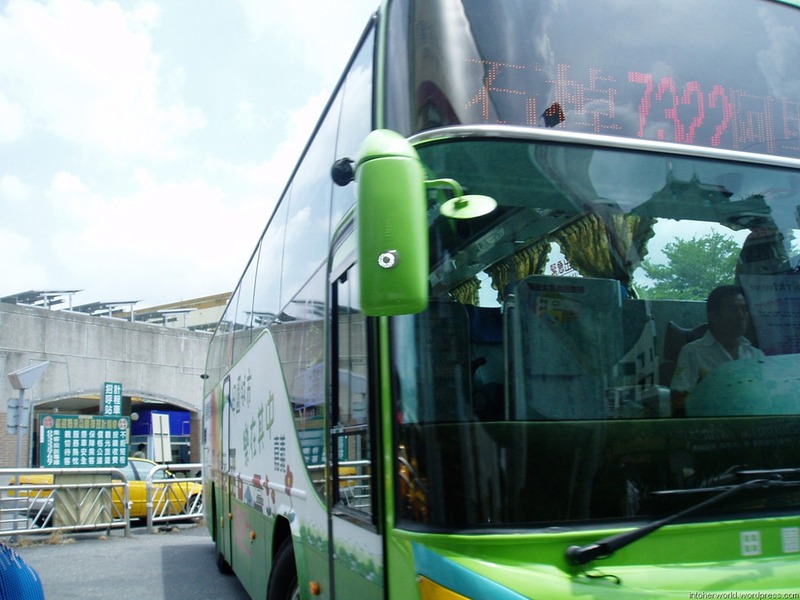 Our plan was to take the local Chiayi City Bus to Alishan Forest Recreation Area. While searching for the bus schedule, I came across this guide by sinotour (http://sinotour.com/tourguide/alishan/transportation.asp) which I found very helpful. According to the schedule provided, one could either take the 10.10am or 11.40am bus from Chiayi HSR station direct to Alishan (2 1/2 hours journey, NT$255 per pax). We missed the 10.10am bus. As we did not want to waste time waiting for the 11.40am bus, we decided to take the other alternative. We took the free shuttle bus to Chiayi train station (30 mins), walked over to the nearby bus station (5-10 mins) and took the 11.10am bus to Alishan (2 hours, NT$221). 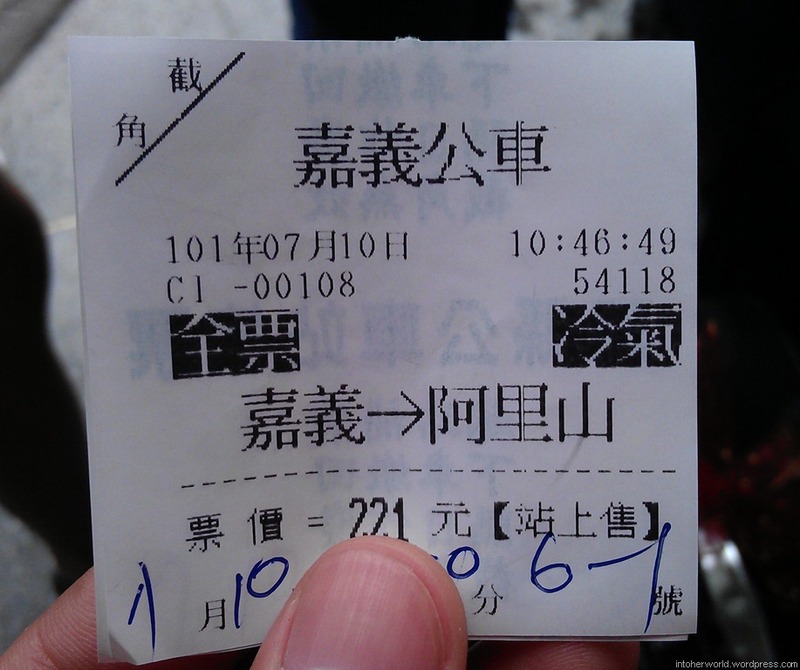 We saved NT$170 ( NT$34×5) and arrived 40 minutes earlier than if we were to take the 11.40am bus from the HSR station. *Note: The free shuttle bus drop-off point is at Chiayi train station (back entrance). You would have to walk to the front by crossing an overheard bridge. 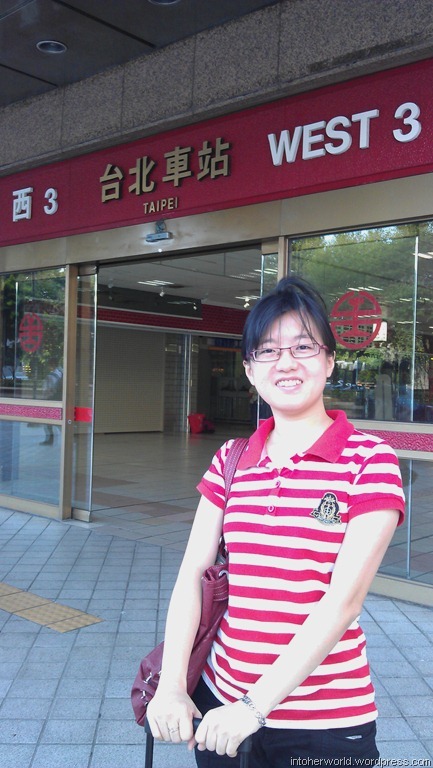 The picture below shows the front station of Chiayi TRA. If you are facing the station, the ticket counter and waiting area for the bus to Alishan is to your left. Taking the direct bus from the HSR station would save us a lot of hassle. In retrospect, we should have taken the 8.00 am bullet train from Taipei in order to make it for the 10.10 am direct bus. Otherwise, we could have slept in and take the 10.00 a.m. bullet train and still make it for the 11.4o am direct bus. After about 1 1/2 hours of winding mountain road, we stopped for a quick toilet break in a small town. It was another 45 minutes before we reached our destination. At the entrance to Alishan Forest Recreation Area, we had to disembark from the bus to pay the entrance fee – NT$150 (for those arriving on public transport). Kiate, my brother and I only had to pay NT$100 each because we showed them our youth travel cards. 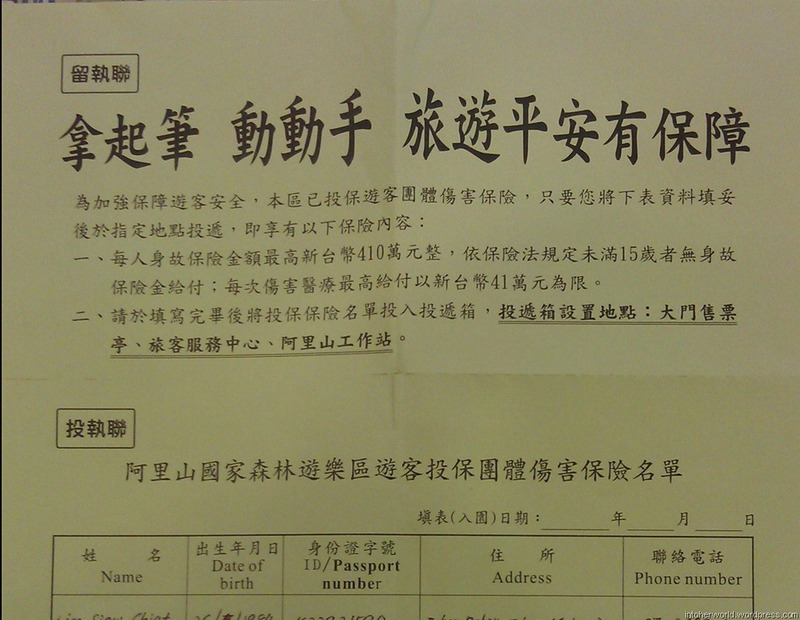 *Note: The entrance fees included a group insurance policy for the duration of our stay at Alishan Forest Recreation Area. We were given the following insurance form which we filled out and submitted at the Visitors’ Centre after we checked in. Kiate took this picture while standing in front of the Visitors’ Centre. When we disembarked from the bus, the owner of XinXin ‘minsu’ 欣欣民宿 came to greet us and showed us the way to his ‘minsu’. After checking in, we freshened up and went out to explore the area. The temperature was around 16°C-18°C and it was drizzling slightly when we arrived.